Thank you for joining us as we worship the Lord. 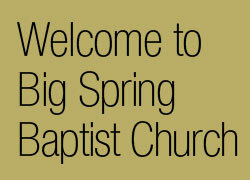 We are so very glad you are here with us today and hope your day is filled with the Holy Spirit and love. If you are visiting with us for the first time, we would like to get to know you and ask that you fill out one of our blue Welcome Cards and place them in the offering plate. If you have special prayer needs, there are cards to fill out for those needs also. Victor's Crown: An Easter Musical presented by Tom Wickes and the Big Spring Choir. 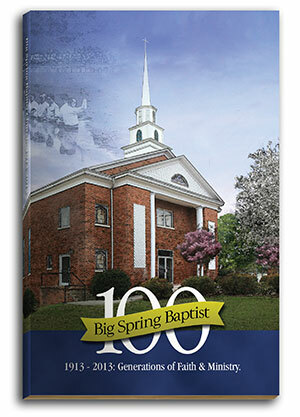 We have developed a keepsake book outlining the story of Big Spring and its members. These 240 page books are now complete. If you pre-ordered, please contact David Robinson. If you did not preorder a limited number will be available for approximately $15.00 each.